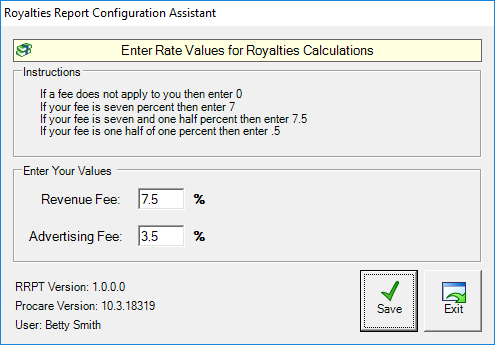 For franchise locations, use the Royalties Reports to calculate revenue-based royalties and advertising fees using your specific rates. There are several versions available under Reports > Standard Reports > Family Accounting > Charge/Credit Summary. Hint: If you’re not using these reports, you may hide them by going to Report Management. Do this to set your revenue and advertising fees (if any). This only needs to be done one time unless your rates change. 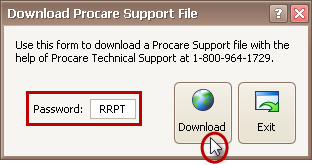 From the main screen of Family Data & Accounting, go to Utilities > Download Procare Support File. Enter the password RRPT and choose Download. Type in the rates based on your franchise agreement for the following items or enter 0.0 if the rate does not apply. The rates shown are only examples. 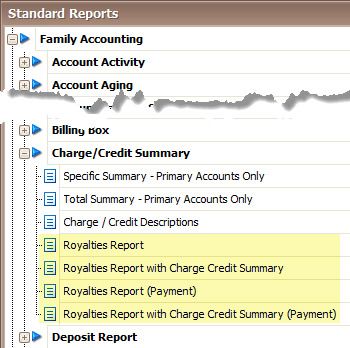 From the main screen of Family Data & Accounting, go to Reports > Standard Reports > Family Accounting > Charge/Credit Summary. Choose one of the following reports depending on what you are required to report. Check with your franchise to determine which report to use. The Royalties Report is a one-page summary based on tuition charged. Download a sample (1 page). The Royalties Report with Charge Credit Summary includes more detail and is also based on tuition charged. Download a sample (3 pages). Coming soon: The Royalties Report (Payment) is a one-page summary based on payments received. Download a sample (1 page). 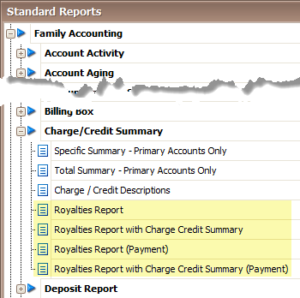 Coming soon: The Royalties Report with Charge Credit Summary (Payment) includes more detail and is also based on payments received. Download a sample (3 pages). Enter a Date Range and click Run Report.